Art Deco (), or Deco, is an influential visual arts design style that first appeared in France just before World War I  and began flourishing internationally in the 1920s, 1930s and 1940s before its popularity waned after World War II. It took its name, short for Arts Décoratifs, from the Exposition Internationale des Arts Décoratifs et Industriels Modernes (International Exposition of Modern Decorative and Industrial Arts) held in Paris in 1925. It is an eclectic style that combines traditional craft motifs with Machine Age imagery and materials. The style is often characterized by rich colours, bold geometric shapes and lavish ornamentation. Deco emerged from the motifs favoured by its predecessor Art Nouveau. The first use of the term Art Deco is sometimes attributed to architect Le Corbusier, who penned a series of articles in his journal L'Esprit nouveau under the headline "1925 Expo: Arts Déco". He was referring to the 1925 Exposition Internationale des Arts Décoratifs et Industriels Modernes (International Exposition of Modern Decorative and Industrial Arts). The term came into more general use in 1966, when a French exhibition celebrating the 1925 event was held under the title Les Années 25: Art Déco/Bauhaus/Stijl/Esprit Nouveau. Here the term was used to distinguish the new styles of French decorative crafts that had emerged since the Belle Epoque. The term Art Deco has since been applied to a wide variety of works produced during the Interwar period (L'Entre Deux Guerres), and even to those of the Bauhaus in Germany. 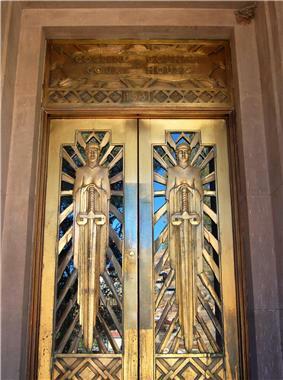 However, Art Deco originated in France. It has been argued that the term should be applied to French works and those produced in countries directly influenced by France. Art Deco gained currency as a broadly applied stylistic label in 1968 when historian Minneapolis Institute of Arts, which he details in his book about it, The World of Art Deco. Some historians trace Deco's roots to the Universal Exposition of 1900. After this show a group of artists established an informal collective known as La Société des artistes décorateurs (Society of Decorative Artists) to promote French crafts. Among them were Hector Guimard, Eugène Grasset, Raoul Lachenal, Paul Bellot, Maurice Dufrêne and Emile Decoeur. 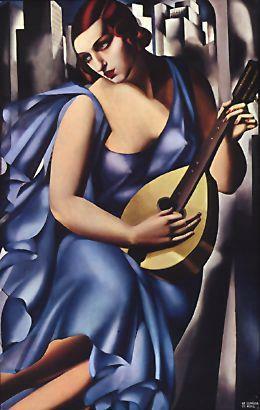 These artists are said to have influenced the principles of Art Deco. The Art Deco era is often anecdotally dated from 1925 when the applied arts, although the style had been in full force in France for several years before that date. Deco was heavily influenced by pre-modern art from around the world and observable at the Musée du Louvre, Musée de l'Homme and the Musée national des Arts d'Afrique et d'Océanie. During the 1920s, affordable travel permitted in situ exposure to other cultures. There was also popular interest in archeology due to excavations at Pompeii, Troy, the tomb of Tutankhamun, etc. Artists and designers integrated motifs from ancient Egypt, Mesopotamia, Greece, Rome, Asia, Mesoamerica and Oceania with Machine Age elements. 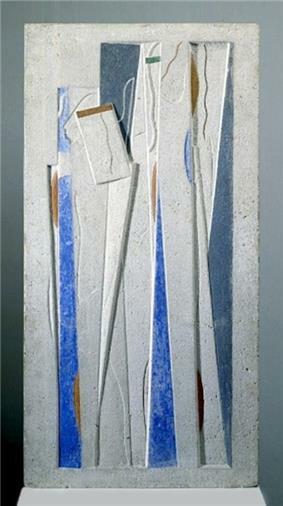 Deco was also influenced by Cubism, Constructivism, Functionalism, Modernism, and Futurism. In 1905, before the onset of Cubism, Eugène Grasset wrote and published Méthode de Composition Ornementale, Éléments Rectilignes, within which he systematically explored the decorative (ornamental) aspects of geometric elements, forms, motifs and their variations, in contrast with (and as a departure from) the undulating Art Nouveau style of Hector Guimard, so popular in Paris a few years earlier. Grasset stresses the principle that various simple geometric shapes like triangles and squares are the basis of all compositional arrangements. At the 1907 Minneapolis Institute of Arts. Simultaneously, there was a retrospective exhibition of 56 works by Paul Cézanne, as a tribute to the artist who died in 1906. Cézanne was interested in the simplification of forms to their geometric essentials: the cylinder, the sphere, the cone. Paul Iribe created for the couturier Paul Poiret esthetic designs that shocked the Parisian milieu with its novelty. These illustrations were compiled into an album, Les Robes de Paul Poiret racontée par Paul Iribe, published in 1908. At the 1910 Salon des Indépendants, Jean Metzinger, Henri Le Fauconnier and Robert Delaunay, shown together in Room 18, elaborated upon Cézannian syntax, revealing to the general public for the first time a "mobile perspective" in their art, soon to become known as Cubism. Several months later, the Salon d'Automne saw the invitation of Munich artists who for several years had been working with simple geometric shapes. Leading up to 1910 and culminating in 1912, the French designers André Mare and Louis Sue turned towards the quasi-mystical Golden ratio, in accord with Pythagorean and Platonic traditions, giving their works a Cubist sensibility. The artists of the Section d'Or exhibited (in 1912) works considerably more accessible to the general public than the analytical Cubism of Picasso and Braque. The Cubist vocabulary was poised to attract fashion, furniture and interior designers. These revolutionary changes occurring at the outset of the 20th century are summarized in the 1912 writings of André Vera. Le Nouveau style, published in the journal L'Art décoratif, expressed the rejection of Art Nouveau forms (asymmetric, polychrome and picturesque) and called for simplicité volontaire, symétrie manifeste, l'ordre et l'harmonie, themes that would eventually become ubiquitous within the context of Art Deco. Grand dining room of the ocean liner SS Normandie (1935), with Lalique glass ceiling. Between 1910 and 1913, Paris saw the construction of the Théâtre des Champs-Élysées, 15 avenue Montaigne, another sign of the radical aesthetic change experienced by the Parisian milieu of the time. The rigorous composition of its facade, designed by Auguste Perret, is a major example of early Art Deco. The building includes exterior bas reliefs by Antoine Bourdelle, a dome by Maurice Denis, paintings by Édouard Vuillard and Jacqueline Marval, and a stage curtain design by Ker-Xavier Roussel. It took its inspiration from classical architecture, and featured straight lines, geometric forms, and decoration in the form of sculptured plaques attached to the exterior. By the 1930s the style had become much more flamboyant, and added much more decoration on the facade. It was particularly popular for movie theaters, such as the Grand Rex in Paris (1932), and Radio City Music Hall in New York City; and in the decoration of skyscrapers. The art deco style was not limited to buildings on land; the ocean liner SS Normandie, whose first voyage was in 1935, featured art deco design, including a dining room whose ceiling and decoration was made of glass by Lalique. In the Art Décoratif section of the 1912 Salon d'Automne, an architectural installation was exhibited that quickly became known as La Maison Cubiste (The Cubist House). The facade was designed by Raymond Duchamp-Villon and the interior by André Mare along with a group of collaborators. "Mare's ensembles were accepted as frames for Cubist works because they allowed paintings and sculptures their independence", writes Christopher Green, "creating a play of contrasts, hence the involvement not only of Gleizes and Metzinger themselves, but of Marie Laurencin, the Duchamp brothers (Raymond Duchamp-Villon designed the facade) and Mare's old friends Léger and Roger de La Fresnaye". La Maison Cubiste was a fully furnished house, with a staircase, wrought iron banisters, a living room—the Salon Bourgeois, where paintings by Marcel Duchamp, Jean Metzinger, Albert Gleizes, Marie Laurencin and Fernand Léger were hung—and a bedroom. It was an early example of L'art décoratif, a home within which Cubist art could be displayed in the comfort and style of modern, bourgeois life. Spectators at the Salon d'Automne passed through the full-scale 10-by-3-meter plaster model of the ground floor of the facade. 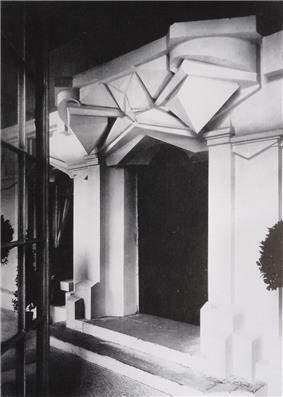 This architectural installation was subsequently exhibited at the 1913 Armory Show, New York, Chicago and Boston, listed in the catalogue of the New York exhibit as Raymond Duchamp-Villon, number 609, and entitled "Facade architectural, plaster" (Façade architecturale). Deco emphasizes geometric forms: spheres, polygons, rectangles, trapezoids, zigzags, chevrons, and sunburst motifs. Elements are often arranged in symmetrical patterns. Modern materials such as aluminum, stainless steel, Bakelite, chrome, and plastics are frequently used. Stained glass, inlays, and lacquer are also common. Colors tend to be vivid and high contrast. 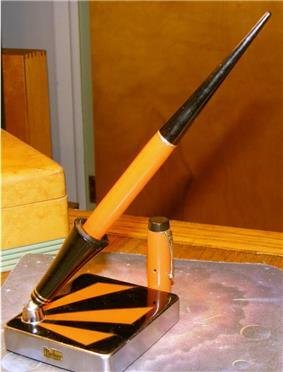 Art Deco was a globally popular style and affected many areas of design. It was used widely in consumer products such as automobiles, furniture, cookware, china, textiles, jewelry, clocks, and electronic items such as radios, telephones, and jukeboxes. It also influenced architecture, interior design, industrial design, fashion, graphic arts, and cinema. During the 1930s, Art Deco was used extensively for public works projects, railway stations, ocean liners (including the Île de France, Queen Mary, and Normandie), movie palaces, and amusement parks. The austerities imposed by World War II caused Art Deco to decline in popularity: it was perceived by some as gaudy and inappropriately luxurious. A resurgence of interest began during the 1960s. Deco continues to inspire designers and is often used in contemporary fashion, jewelry, and toiletries. A style related to Art Deco is Streamline Moderne (or Streamline) which emerged during the mid-1930s. Streamline was influenced by modern aerodynamic principles developed for aviation and ballistics to reduce air friction at high velocities. Designers applied these principles to cars, trains, ships, and even objects not intended to move, such as refrigerators, gas pumps, and buildings. 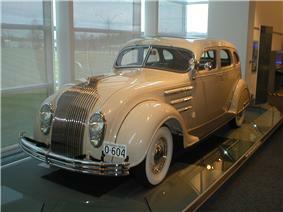 One of the first production vehicles in this style was the Chrysler Airflow of 1933. It was unsuccessful commercially, but the beauty and functionality of its design set a precedent. Streamlining quickly influenced automotive design and evolved the rectangular "horseless carriage" into sleek vehicles with aerodynamic lines, symmetry, and V-shapes. These designs continued to be popular after World War II. 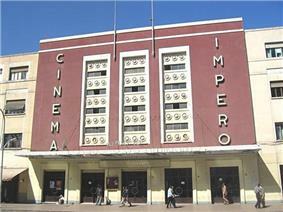 The Cinema Impero was constructed in Asmara (Eritrea) in 1937. It is a famous example of the Art Deco style. During Portuguese colonial rule in Angola and Mozambique, a large number of buildings were erected especially in the capital cities of Luanda and Maputo. Africa's most celebrated examples of Art Deco were built in Eritrea during Italian rule. Many buildings survive in Asmara, the capital, and elsewhere. There are a few Art Deco buildings in Egypt, one of the most famous being the former Cadillac dealership in downtown Cairo and Casa d'Italia in Port Said (1936)— designed by the Italian architect Clemente Busiri Vici. Also, there are many buildings in downtown Casablanca, Morocco's economic capital. Cities in South Africa also contain examples of Art Deco design such as the City Hall, in Benoni, Gauteng, constructed in 1937. In Bangladesh, a number of Art Deco structures are found in Chittagong and Rajshahi. Built during the 1950s, they include the University of Rajshahi, the Chittagong Customs House and the Jamuna Bhaban among others. In China, at least 60 buildings, of which many are Art Deco, designed by Hungarian architect László Hudec survive in downtown Shanghai. There are a few Art Deco survivors in Hong Kong, (The Peninsula Hong Kong 1928, Bank of China Building (Hong Kong) 1952) with high profile buildings demolished to make way for the modern skylines (HSBC Building 1935, demolished 1978). Residential buildings in Hong Kong Island and Kowloon used basic Art Deco theme at a much smaller scale. The Star Ferry Pier, Central and Tsim Sha Tsui Ferry Pier (both built 1957 and former demolished 2006) were both Streamline Moderne with some Art Deco elements. In Indonesia, the largest stock of Dutch East Indies-era buildings is found in the large cities of Java. Bandung has one of the largest remaining collections of 1920s Art Deco buildings in the world, including those by several Dutch architects and planners, notably Albert Aalbers's DENIS bank (1936) in Braga Street and the renovated Savoy Homann Hotel (1939). Others were Thomas Karsten, Henri Maclaine Pont, J Gerber and C.P.W. Schoemaker. The Sociëteit Concordia (now Merdeka Building) is a historic building in Bandung designed by Van Galen Last and C.P. Wolff Schoemaker. In Jakarta, surviving Art Deco buildings include the Nederlandsche Handel Maatschappij building (1929), now the Museum Bank Mandiri, by J. de Bruyn, A. P. Smiths, and C. Van de Linde; the Jakarta Kota Station (1929) designed by Frans Johan Louwrens Ghijsels, and the Metropole Cinema in Menteng. Examples of Art Deco architecture in George Town, Penang. Mumbai has the second largest number of Art Deco buildings after Miami. The Art Deco style was also adopted in Chennai between the 1920s and 1940s though it was utilized to a lesser extent. In the Philippines, Art Deco buildings are found mostly in Manila, Baguio, Iloilo City, Quezon City, and Sariaya. The best examples of these are the older buildings of the Far Eastern University and the Manila Metropolitan Theater, both in Manila. 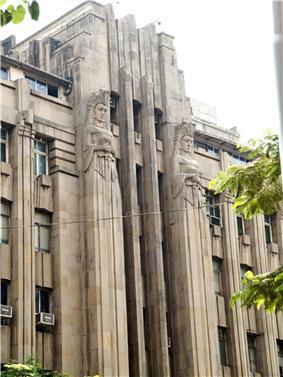 In Argentina, architect Alejandro Virasoro introduced Art Deco in 1926 and developed the use of reinforced concrete, with the Banco El Hogar Argentino and the Casa del Teatro (both in Buenos Aires) being his most important works. The Kavanagh building (1934), by Sánchez, Lagos and de la Torre, was the tallest reinforced concrete structure at its time, and a notable example of late Art Deco style. In the Buenos Aires Province, architect Francisco Salamone designed cemetery portals, city halls and slaughterhouses commissioned by the provincial government in the 1930s; his designs combined Art Deco with futurism. Another country with many examples of Art Deco architecture is Brazil, especially in Porto Alegre, Goiânia and cities like Cipó (Bahia), Iraí (Rio Grande do Sul) and Rio de Janeiro, especially in Copacabana (see Belmond Copacabana Palace). Also in the Brazil's north-east – notably in cities such as Campina Grande in the state of Paraíba – there are Art Deco buildings which have been termed "Sertanejo Art Deco" because of their peculiar architectural features. The reason for the style being so widespread in Brazil is its coincidence with the fast growth and radical economic changes of the country during the 1930s. In Santiago, Chile, the Hotel Carrera (no longer a hotel) is a good example of Art Deco architecture. Art deco buildings are also numerous in Montevideo, Uruguay, including the Palacio Salvo, which was South America's tallest building when it was built in the late 1920s. Some of the finest examples of Art Deco art and architecture are found in Cuba, especially in Havana. The Bacardi Building is noted for its particular Art Deco style. The style is expressed by the architecture of residences, businesses, hotels, and many pieces of decorative art, furniture, and utensils in public buildings, as well as in private homes. Notable art deco buildings in Paris today include the Théâtre des Champs-Élysées by Auguste Perret (1910-1913), the Majorielle building (1911), the MK-2 Gambetta movie theater at 4 rue Belgrand, Paris, (1920), the Studio building (1926–28), and La Samaritaine department store facade (1926–28), by Henri Sauvage; the Palais de Tokyo, constructed for the 1937 Paris Universal Exposition, now the museum of modern art of the City of Paris; and the Grand Rex movie theater (1932). An art deco office for a French Ambassador, designed by Pierre Charlau for the 1925 Paris Exposition of Decorative Arts, is on display at the Museum of Decorative Arts, next to the Louvre, in Paris. In Germany two variations of Art Deco flourished in the 1920s and 30s: The Neue Sachlichkeit (New Objectivity) employed the same curving horizontal lines and nautical motifs that are known as Streamline Moderne in the Anglophone world. While Neue Sachlichkeit was rather austere and reduced (eventually merging with the Bauhaus style), Expressionist architecture came up with a more emotional use of shapes, colors and textures, partly reinterpreting shapes from the German and Baltic Brick Gothic style. Notable examples are Erich Mendelsohn's Mossehaus and Schaubühne theater in Berlin, Fritz Höger's Chilehaus in Hamburg and his Kirche am Hohenzollernplatz in Berlin, the Anzeiger Tower in Hannover and the Borsig Tower in Berlin. Art deco architecture was revived in the late-20th century by architects like Hans Kollhoff (see his tower on Potsdamer Platz), Jan Kleihues and Tobias Nöfer. The 1921 Mossehaus in Berlin by Erich Mendelsohn was a pioneering design in Art Deco and Streamline Moderne, that displays how the Deco style spread and evolved in Europe. Art Deco in Athens incorporated insolently many of the structural and formal characteristics of the Classical idiom, at times transforming them to mere decorative elements, or oppositely, imprinting to them a functionality. Thematically it moved beyond the Classical period and looked for its models in the Mycenaean, Archaic, Hellenistic and Byzantine arts. The classicizing trends however, as one would expect in the city of Parthenon, held strongly, and despite what it has been sometimes suggested, Art Deco was never really independent in Athens. Rather, it accommodated itself in the midst of a strong and ideologically charged classicizing tradition and produced some of the most original and less expected works of the Greek architectural heritage. Like Romania, Lithuania too experienced booming industrial growth during the Interwar period. This resulted in the rapid modernization of the city of Kaunas in particular. At this time it became the temporary capital of Lithuania. Vytautas the Great War Museum, built in 1936 and located in downtown Kaunas, along with the Central Post Building and the Pienocentras HQ Building (1934) are the three most prominent Art Deco structures in the city. Today many of these buildings still stand, and apartment complexes and large government buildings alike survive from this time, even through the Nazi and Soviet occupations of Kaunas. Many other buildings around the city were built in the Bauhaus style. An example of Art Deco in Norway is found in the Student Society in Trondheim (built 1927–29). Its interior is based on an abandoned circus, so that the exterior exhibits a characteristic round shape. As a result of the inter-war period of rapid development, cities in Romania have numerous Art Deco buildings, including government buildings, hotels, and private houses. The best representative in this regard is the capital, Bucharest, which, despite the widespread destruction of its architecture during Communist times, still has many Art Deco examples, both on its main boulevards and in the lesser known parts of the city. 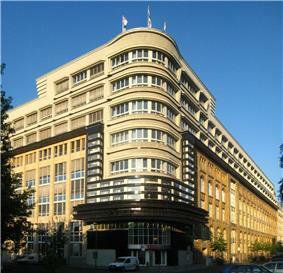 Constanta has the second number of Art Deco buildings after Bucharest. Ploieşti also has many Art Deco houses. Valencia was built profusely in Art Deco style during the period of economic bounty between wars in which Spain remained neutral. Particularly remarkable are the famous bath house Las Arenas, the building hosting the rectorship of the University of Valencia and the cinemas Rialto (currently the Filmoteca de la Generalitat Valenciana), Capitol (reconverted into an office building) and Naruto. The former Arsenal Stadium has the famous East Stand facade. It remains at the Arsenal football club's old home at Highbury, London Borough of Islington, which was vacated in the summer of 2006. Opened in October 1936, the structure now has Grade II listed status and has been converted into apartments. William Bennie, the organizer of the project, famously used the Art Deco style in the final design which was considered one of the most opulent and impressive stands of world football. Du Cane Court, in Balham, south-west London, is a good example of the Art Deco style. It was thought to be possibly the largest block of privately owned apartments under one roof in Britain at the time it was built, and the first to employ pre-stressed concrete. It has a grand reception area and is surrounded by Japanese-style gardens; and it has had many famous residents, especially from the performing arts. Elsewhere in south-west London, is Battersea Power Station, which has appeared in films and artwork including the cover of Pink Floyd's 1977 album Animals. Partially built in the 1930s, the building retains its powerful Art Deco facade. In the middle of Lambeth is the Sunlight Laundry, one of the few surviving Art Deco buildings which is still owned by the commissioning firm and still used for its original purpose. In North East England, the Wills Building, an old cigarette factory, is a fine Art Deco building built in the late 1940s in Newcastle upon Tyne. In North West England, the Midland Hotel, Morecambe is considered one of the finest surviving examples from this period, with sculptures by artist Eric Gill. The buildings and structures related to the Queensway Tunnel which connects Liverpool and Birkenhead are also distinctly Art Deco. 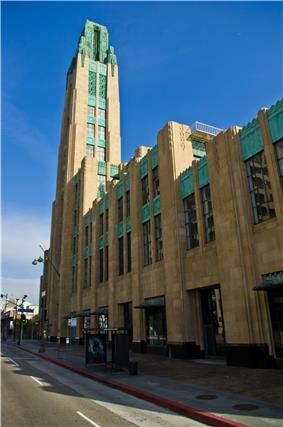 Other notable Art Deco buildings in Liverpool include Philharmonic Hall and the former terminal building at Liverpool Airport—now the Crowne Plaza LJLA. 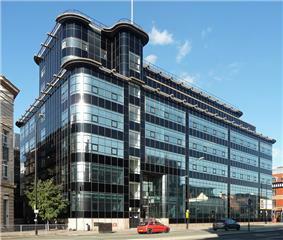 See Art Deco architecture in Liverpool. The City Hall in Norwich is a fine example of the Art Deco style. It has a 206ft clock tower and the balcony is the longest in the UK at 365ft long. In Canada Art Deco structures that survive are mainly in urban centres like Montreal, Toronto, Hamilton, Ontario, and Vancouver. They range from public buildings like Vancouver City Hall to commercial buildings (College Park) to public works (R. C. Harris Water Treatment Plant). Hamilton boasts a large collection of Art Deco buildings as well. Hamilton GO Centre is the only example of Art Deco railway station architecture in Canada. Other buildings include: The Pigott Building, an 18-storey condominium (1929), The Sunlife Building, The Bell Telephone Baker Exchange (first telephone exchange in the British Empire, 1929), Dominion Public Building refurbished into the John Sopinka Courthouse (1936), and The Hamilton Port Authority (1953). In Montréal, the Salle Ernest Cormier at Université de Montréal is considered an example of the Art Deco style. In Mexico City, art deco residential buildings abound in the chic Condesa neighborhood, many designed by Francisco J. Serrano. The interior of the Palacio de Bellas Artes is a fine example. Another is the Edificio El Moro which has the Loteria Nacional nowadays. It was also the biggest building of Mexico City at the time it was completed. 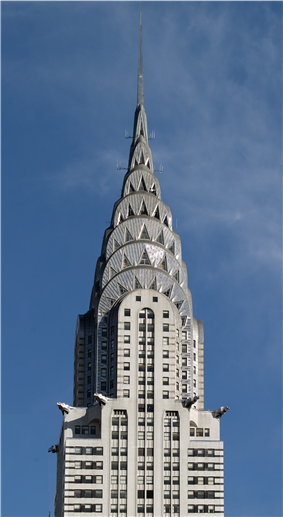 The U.S. has many examples of Art Deco architecture. Chicago, Los Angeles, and New York have many Art Deco buildings: the famous skyscrapers are the best-known, but notable Art Deco buildings can be found in various neighborhoods. 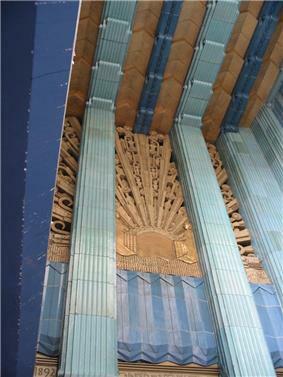 Art deco was popular during the later years of the movie palace era of theatre construction. Excellent examples of Art Deco theatres, such as the Fargo Theatre in Fargo, North Dakota, and The Campus Theatre in Lewisburg, Pennsylvania, still exist throughout the United States. In 2005, the largest residential restoration project in the country and the largest collection of Art Deco buildings in New Jersey began at the 14-acre (5.7 ha) site of the former Jersey City Medical Center in Beacon, Jersey City. The conversion of the national historic site to a residential enclave had, as of 2009, been completed on three of the several buildings on the site. In Beaumont, Texas, the First National Bank Building, Jefferson County Courthouse, and Kyle Building are some of the few Art Deco buildings still in the city. The Cincinnati Union Terminal occupies an Art Deco-style passenger railroad station that began operation in 1933. Its semi-dome is the largest in the western hemisphere, measuring 180 feet (55 m) wide and 106 feet (32 m) high. After the decline of railroad travel, most of the building was converted to other uses. Now the Cincinnati Museum Center, it serves more than one million visitors per year and is the 17th most visited museum in the United States. Cincinnati is also home to the Carew Tower, a 49-story Art Deco skyscraper finished in 1931. The Cinema Theater in Rochester, New York was renovated, and had an Art Deco style facade installed, in 1949. Fair Park, located in Dallas, contains a large collection of Art Deco buildings, art, and sculpture. Fair Park was built for the 1936 World's Fair, also known as the Texas Centennial Exposition, celebrating the 100th anniversary of the Republic of Texas. The park is 277 acres and is the last surviving pre-1950 World's Fair site. Fair Park hosts the annual State Fair of Texas, the largest state fair in the United States. Detroit's many examples of Art Deco architecture include the Fisher Building, Fox Theatre, and Guardian Building, all of which are now National Historic Landmarks, as well as the David Stott and Penobscot Buildings. Flint, Michigan is home to The Paterson Building, which has extensive Art Deco features throughout the interior and exterior. The Hoover Dam is a somewhat unusual example of Art Deco design. Many guides state that the design was to be Gothic Revival, including the installation of gargoyles with water shooting out of their mouths. Ezekiel W. Cullen Building, and the 1940 Air Terminal Museum. Kansas City, Missouri is home to the Kansas City Power and Light Building, completed in 1931. This building is a good example of the Great Depression's effect on Art Deco construction. Original plans were for a twin tower to go next to it on its west side. However, it was never built due to financial constraints. As a result, the 476-foot (145 m) tower has a bare west side, with no windows. 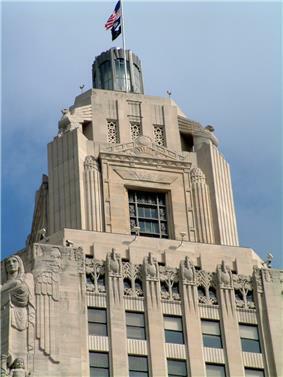 Other examples of Deco in Kansas City include the 909 Walnut, the Jackson County Courthouse, Kansas City City Hall, and the Municipal Auditorium. The recently opened Smith Center in Downtown Las Vegas incorporates many design elements from Hoover Dam and, therefore, is a contemporary example of the use of Art Deco style. Los Angeles' Art Deco architecture is particularly found along Wilshire Boulevard, a main thoroughfare that experienced a period of intense construction activity during the 1920s. Notable examples include the Bullocks Wilshire building and the Pellissier Building and Wiltern Theatre, built in 1929 and 1931 respectively. Both buildings experienced recent restoration. Miami Beach, Florida has a large collection of Art Deco buildings, with some 30 blocks of hotels and apartment houses dating from the 1920s to the 1940s. In 1979, the Miami Beach Architectural District was listed on the National Register of Historic Places. Nearly all the buildings have been restored. Minneapolis has the Foshay Tower, which was finished in 1929. Built immediately before the Great Depression, it is the only obelisk-shaped office building in the world. Minneapolis also has the Rand Tower, the CenturyLink Building, the Minneapolis Post Office, and the Wells Fargo Center, an example of modern Art Deco architecture. Rochester, Minnesota has the Plummer Building, from 1927, the original building for the world-famous Mayo Clinic. St. Paul, Minnesota is home to the First National Bank Building and the Saint Paul City Hall. The Guadalupe County Courthouse and the nearby Municipal Building in Seguin, Texas show successful use of the style in public buildings erected as make-work projects in small towns during the New Deal. Syracuse, New York is home to the Niagara Mohawk Building, completed in 1932 and listed as a National Historic Landmark. Niagara Mohawk was considered at the time to be the nation's most powerful electricity supplier, thus the building emphasized a vast futuristic look with an electric style embedded into it. Much of the Art Deco heritage of Tulsa, Oklahoma, remains from that city's oil boom days. The Manchester Unity Building (Melbourne) features purely decorative towers to circumvent the height restriction laws of the time, and the former Russell Street Police Headquarters in Melbourne, with its main multi-storey brick building designed by architect Percy Edgar Everett, is reminiscent of the design of the Empire State Building. In St Kilda, Victoria, the Palais and the Astor theatres are considered some of the finest surviving Art Deco buildings in Australia, while many rural towns such as Wagga Wagga, Innisfail, Albury and Griffith also have significant amounts of Art Deco buildings and homes. Sydney's ANZAC War Memorial and "mini-skyscrapers", such as the Grace Building (Sydney) and the AWA Tower in Sydney, which consists of a radio transmission tower atop a 15-story building. Sydney has a large number of survining art deco houses, particularly in its inner suburbs. Hastings, New Zealand was also rebuilt in Art Deco style after the 1931 Hawke's Bay earthquake, and many fine Art Deco buildings survive. The city of Napier, New Zealand, was rebuilt in the Art Deco style after being largely razed by the Hawke's Bay earthquake of 3 February 1931 and is the world's most consistently Art Deco city. Although a few Art Deco buildings were replaced with contemporary structures during the 1960s, 1970s and 1980s, most of the centre remained intact long enough to become recognized as architecturally unique, and from the 1990s onwards had been protected and restored. 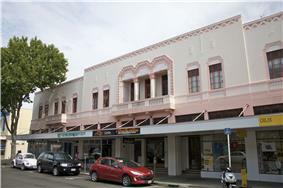 As of 2007, Napier has been nominated for UNESCO World Heritage Site status, the first cultural site in New Zealand to be nominated. According to the World Heritage Trust, when Napier is compared to the other cites noted for their Art Deco architecture, such as Miami Beach, Santa Barbara, Bandung in Indonesia (planned originally as the future capital of Java), and Asmara in Eritrea (built by the Italians as a model colonial city), "none ... surpass Napier in style and coherence. Wellington has retained a sizeable number of Art Deco buildings, in spite of constant post-World War II development. Paul Landowski, Christ the Redeemer, constructed between 1922 and 1931, was the largest Art Deco statue in the world until Poland's 2010 statue, Christ the King. Art Deco of the 20s and 30s, a 1968 book by Bevis Hillier. ^ Plum 1914, p. 134. ^ Poisson 2009, pp. 318-319. ^ "Asian Decadent Deco" : Hong Kong's forgotten buildings. SkyscraperCity. Retrieved on 2014-04-12. ^ Sideris A., "Art Deco in Athens: Modernizing the Classical", Studia Hercynia 13, 2009, pp. 76-91.